The Town of Orleans bought the property, referred to as the Paw Wah Pond Conservation Area in 1987 to prevent a 7-lot subdivision being developed as an investment by the Environmental Minister of the Sultanate of Oman! The property comprises a 9.3-acre parcel of upland and beach on Little Pleasant Bay and a 2.3-acre salt marsh on Paw Wah Pond, which is an 8-acre salt pond. The upland part of this property features a mixed forest community of pitch pine, white pine, and black and white oak, while the marshland is dominated by a variety of Spartina grasses. Both of these ecosystems play important roles in the maintenance of habitat diversity, and when combined they provide habitat for the recovering osprey and Spartina borer. Directions: From the intersection of Rt. 28 and Main Street Orleans head south on Rt. 28 towards Chatham (1.7 miles). 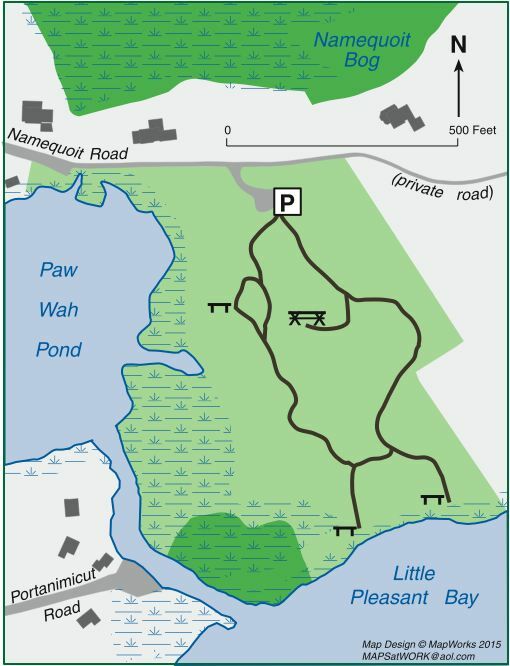 Take a left onto Namequoit Road and follow for 1 mile to trail head parking on right.